Grapefruit grown in CUPS can produce desirably sized fruit (cell phone for size reference) at high yields. Two studies with citrus under protective screen (CUPS) were established at the University of Florida Institute of Food and Agricultural Sciences (UF/IFAS) Citrus Research and Education Center (CREC) and Indian River Research and Education Center (IRREC) in 2013–14. The goal was to demonstrate the profitable production of high-quality, disease-free fresh citrus in huanglongbing (HLB)-endemic Florida. A 2017 Citrus Industry article reported on the protective and horticulturally important characteristics of the high-density polyethylene (HDPE) screen and the early, high fruit yields possible due to complete blockage of HLB transmission by exclusion of the Asian citrus psyllid (ACP). This article discusses the impacts of and recovery from Hurricane Irma (September 2017), provides an update on the 2017–18 grapefruit harvest at the CREC CUPS, and gives updates on ACP, HLB and grapefruit yields from the IRREC CUPS. The protected citrus experiments in both locations are about 1 acre each. The screen houses consist of 14-foot-high pole and cable frame architecture covered with “50-mesh” anti-insect HDPE screen. In 2016–17, about 50 acres of commercial CUPS were established in Florida, with at least 150 more acres planned or in progress. Hurricane-induced damage to CUPS structures in 2017 was variable and ranged from catastrophic to repairable. CUPS locations further south in peninsular Florida suffered more wind damage (Category 2 hurricane, with wind gusts over 100 mph), and all locations were impacted by flooding rain of 8 to 20 inches. One of the interesting lessons learned was the significance of the in-ground anchor system and its vulnerability to a combination of soil flooding and strong wind, which can cause it to be pulled out of the ground. Typically, the anchors consist of long rods with helical anchor heads that are driven into the soil and attached to supporting cables at the tops of perimeter poles of the screen house structure. Based on experience from the last hurricane season, one grower has transitioned from using dual perpendicular ground anchors attached by two cables to each perimeter pole. He is now using a system with two ground anchors inserted in the ground behind each other and attached by separate cables to a perimeter pole. The grower also increased the size of internal pole anchors from a 5-foot-long, 6-inch-diameter helix anchor to one that is 7 feet long with an 8-inch diameter. At the CREC CUPS, turnbuckles were installed on all anchor cables to allow rapid, optimal tension adjustment of the CUPS structure. The ability to tighten the structure screen will hopefully result in a decrease in wind-induced screen damage caused by the flapping of loose screen or movement of poles. Time will tell if these modifications will result in a strengthening of a CUPS structure. When storm-related or other damage causes a CUPS structure to be torn and opened, the first priority should be to reseal the screen so that ACP continue to be excluded. At the CREC CUPS, the damage was extensive but not catastrophic, and repairs were conducted quickly after Hurricane Irma passed. As a result, we did not detect any psyllids in the CUPS post-storm, and likewise have not observed any HLB symptoms on the protected trees. 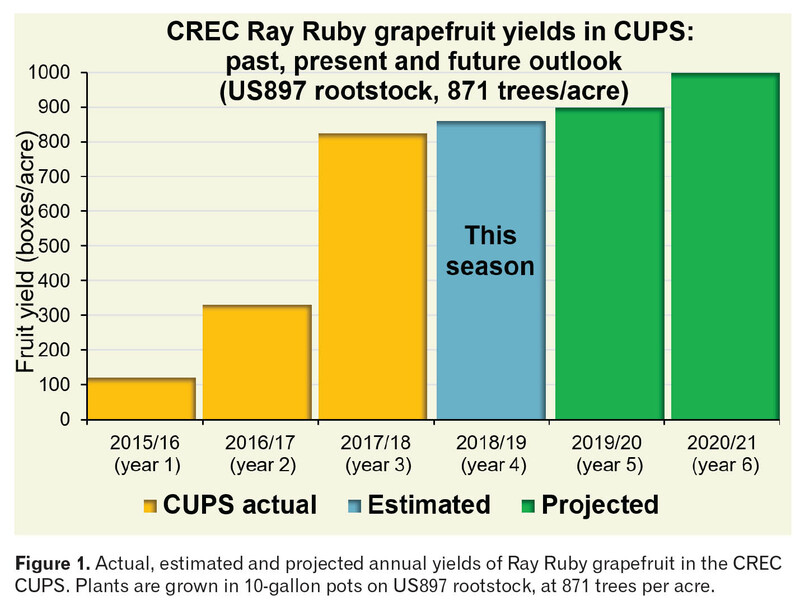 There are 0.22 acres of Ray Ruby grapefruit trees in the CREC CUPS, planted on X639, sour orange, and US897 rootstocks at a density of 871 trees/acre (5 by 10 feet). All trees were planted in GroPro pots with a 50 percent blend of Canadian peat moss and perlite, and are supplied with daily fertigation. The GroPro pots are designed to prevent root circling. Past, current and future projected yields are shown in Figure 1. The current yields were estimated from fruit counts and the previous season’s average fruit size. After plot yields were recorded for analysis of the various treatments, the entire block of grapefruit was picked for commercial packing and sales. Average fruit yields were greater than 800 boxes per acre. Packinghouse reports were again favorable for grapefruit in the 2017–18 season (year 3), with good internal quality, a 100 percent pack-out, and 75 percent of the CUPS fruit classified in 40/36/32 size classes (Figure 2). The 40/36/32 grapefruit sizes are reportedly the most popular with consumers and fetched the highest prices (up to $36/box). Grapefruit harvested in 2017–18 from the adjacent outdoor control block was not suitable for sale, yielding only 80 boxes per acre, with only 11 percent of the fruit sizes in the most profitable range (Figure 2). Additionally, the internal quality of the control fruit was compromised by HLB, recording significantly higher acid and lower brix contents. After four years, the CUPS trial demonstrated a successful intensive fresh grapefruit production system. It contrasted strongly with the failing outdoor trees that were inadequately protected from ACP using conventional pesticides. The IRREC CUPS project was implemented in September 2013 at a density of 792 trees per acre to assess the ability of screened structures to exclude psyllids, reduce HLB disease incidence and yield economically profitable fresh grapefruit in the Indian River Citrus District. Irrigation is applied daily using two 2-gallon-per-hour drip emitters per tree. Fertigation is applied three times per week using water soluble fertilizer (15-11-31 + 0.75 magnesium) at 160 pounds nitrogen per acre per year. Foliar nutrients, insecticides and fungicides are applied as needed and based on scouting. In March of 2018, monitoring of psyllids with sticky cards changed from once monthly to twice monthly in response to the detection of psyllids after Hurricane Irma (Figure 3A). Irma damaged the screen structures in September 2017, leaving openings until repairs were completed in April 2018. Psyllids were detected inside the screen houses (Figure 3A, accumulated until August). Psyllid counts are not zero due to sprayer calibration issues resulting in incomplete coverage and difficulties scheduling applications to avoid rain during the Florida rainy season. Leaf samples were collected and tested for HLB once per year. In 2018, diagnostics were performed by Southern Gardens. Inside screen house trees tested negative, while outside trees tested positive for HLB (Figure 3B). The 2017–2018 season was the third year that yield was determined (Figure 3C). 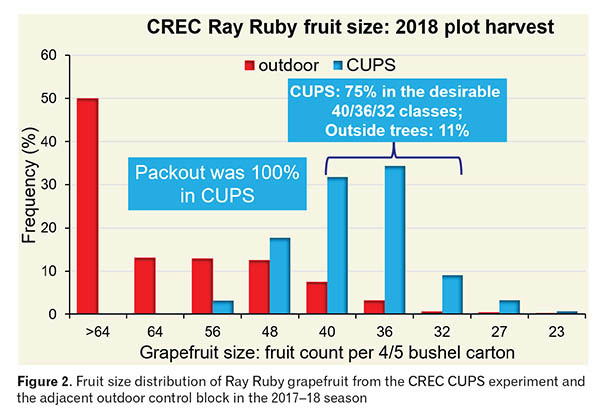 Ray Ruby grapefruit yield was greater inside the screen houses due to the absence of HLB (average of 0.33 boxes per tree; 263 boxes per acre) compared to the outside blocks (0.02 boxes per tree; 18 boxes per acre). While there were significant differences between the yield inside and outside, there was no difference in yield between inside pots and ground trees and outside pots and ground trees in 2016. In 2017, potted trees on sour orange yielded significantly more fruit than trees in the ground. Finally, the potted grapefruit trees cultivated inside CUPS had the highest soluble solids content. The screen houses provide for disease exclusion, increased grapefruit yield and quality. The cost of the technology is still under evaluation, along with structural modifications needed to deal with environmental challenges such as hurricanes. IRREC CUPS screen houses are 5 years old, and the screen is experiencing degradation from UV, rainfall and wind, resulting in screen rupture at several points in the roof. Due to this degradation, the screen will have to be replaced in the near future. The 2017–18 Florida citrus season was punctuated by a powerful Category 2 hurricane that caused variable damage to CUPS structures. Improved construction methods and rapid repair (weeks versus months) are essential for maintaining an ACP- and HLB-free environment in CUPS structures. After four years, grapefruit seem to be an excellent fit for CUPS fresh fruit production in Florida. 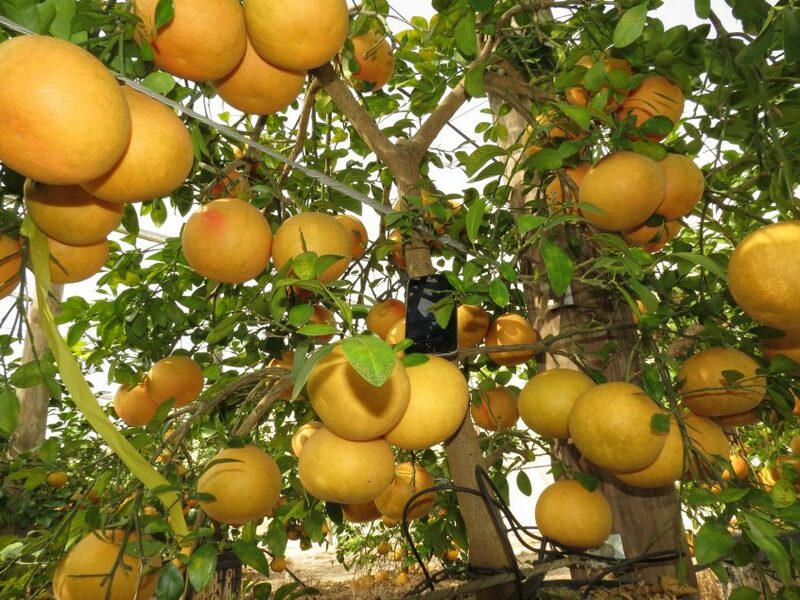 Grapefruit trees produce high yields with minimal alternate bearing, their canopies are easily managed in high planting densities, and they thrive in the high temperatures of CUPS structures. Furthermore, grapefruit is one of the most severely HLB-impacted citrus varieties in Florida, and consequently the price of fresh grapefruit appears to be rising and holding. 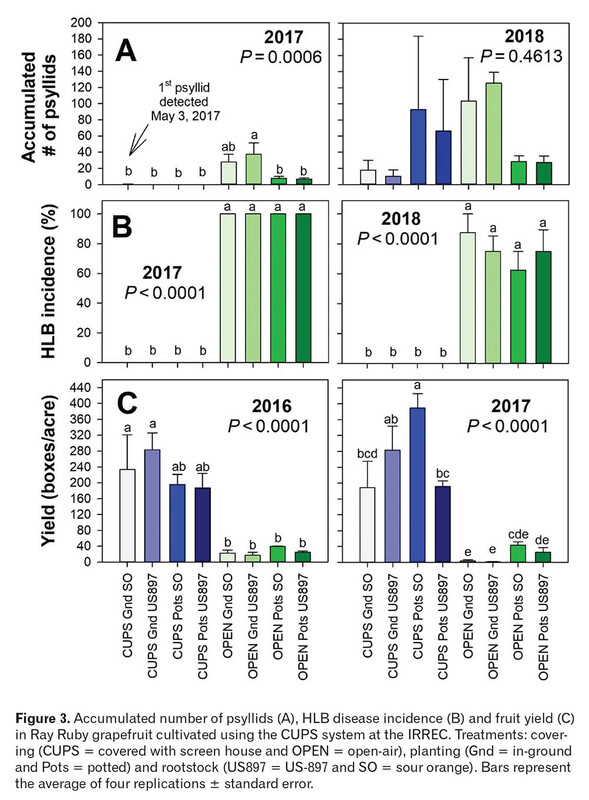 Acknowledgements: The authors thank Ozgur Batuman and Mike Irey for HLB diagnostics; Randy Burton and Jawwad Qureshi for technical support; the UF/IFAS Citrus Initiative, Citrus Research and Education Foundation, U.S. Department of Agriculture (USDA)/National Institute of Food and Agriculture/Citrus Disease Research and Extension Program (Award #2018-70016-27387) and USDA/Florida Department of Agriculture and Consumer Services/Specialty Crop Block Grant (Award #00092195) for funding; and SunGro and ICL Specialty Fertilizers for product donations. Arnold Schumann (schumaw@ufl.edu), Timothy Ebert, Laura Waldo, Danny Holmes, Napoleon Mariner and Gary Test are at the UF/IFAS CREC in Lake Alfred. Chris Oswalt is a UF/IFAS Extension agent in Bartow. Rhuanito Ferrarezi (rferrarezi@ufl.edu) and Ricardo Lesmes are at the UF/IFAS IRREC in Fort Pierce.